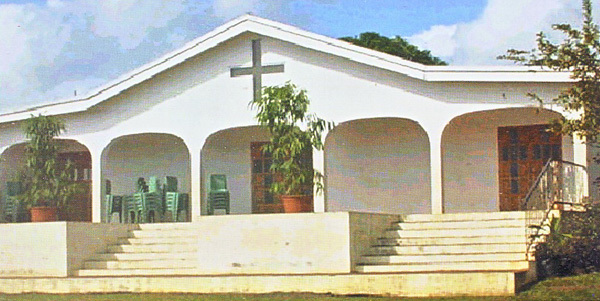 The Church of the Resurrection of the Tagabe Anglican Parish in Port Vila has a membership of about 4,000, coming mainly from the Banks and Torres islands, Pentecost, Ambae, Maewo, Paama, Sheperds, Efate, Aneityum and the local expatriate community. A priest and an assistant parish priest head the parish. Frs. 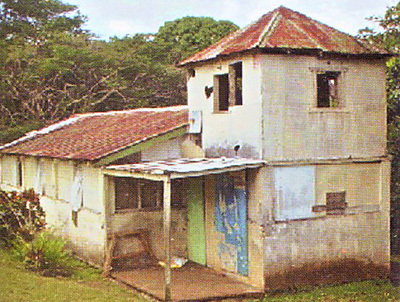 Joseph Tagaro and George Vari were nominated by the Diocesan Bishop in mid 2001 to be Rectors to the Port Vila parish with Ministries to the Chaplainry of Prisons and Hospitals and Rector to the parish. 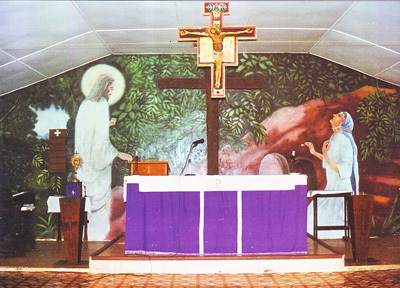 The Port Vila Parish is the only Anglican parish in Shefa province. It is divided into six (6) wards covering both the Port Vila urban and Efate rural areas. In the pre-colonial days Anglican members of the then New Hebrides comprised of basically people from the Banks and Torres, Ambae, Pentecost and Maewo who were recruited as forced labors and were taken to work in the coconut and cotton plantations on Efate owned mainly by French colonial planters. These early Anglican members, upholding their faith in God, toiled in the plantations from dawn to dusk and found time to socialize and worship only on makeshift camps on plantations. As time went by a few left the plantations to find alternative employment around Port Vila, especially within the Ifira customary land boundaries. One of these handfuls of Christian pioneers was the legendary Veve Fanny of Waluriki, on Ambae. "Veve" as she was commonly known then, had just returned from the Norfolk islands Anglican school. She was well known to the early Anglicans of Port Vila for her Charisma, love and devotion among the many from Ambae, Pentecost, Banks and Torres, including the British colonial administrators of the New Hebrides. She then became instrumental in building the Anglican congregation in Port Vila. The Bishop who resided in Honiara, would often travel to the New Hebrides to meet and talk with the British High Commissioner. In one of those visits, Mr Ballard, who was an advocate in the condominium era was asked to approach Veve Fanny to conduct a census of indigenous Anglicans living in Port Vila. This she did. A quick response was received that Anglicans members from Ambae, Pentecost, Maewo and the Banks islands have been meeting regularly to worship at Willy Taraumera's at his home at Malasi. Taraumera hailed from the Torres islands. Mr Ballard then announced that the Bishop from Honiara would visit and conduct baptism for the children and youth. Among the children baptized then, on the Southern Cross boat, were Anis Mathias, John Merian, Patrick Merian and many more. Willy Taraumera, the first pioneer to lead daily worships, passed away and his body was taken across to Ifira Island for burial. The idea to build a permanent church building came into being then. Kakau of Ifira allocated a plot of land to members of the Anglican congregation to erect the first Anglican Church at Tebakor. This church building was very rudimentary, built from tin shacks. The pews and alter were build out of spit palm trunks. Ambrose Kikiri (now diseased) led morning and evening worship in this tiny church known then as the Christ Church. This was before the world war of the 1940s. Soon after the war, thanks to an unwelcoming tropical cyclone, the tiny church was torn apart. From hereon, the Anglican devotees, without a church building found themselves at the premises of a French Planter at Black sands known as Mr Henin. Mr. Henin then recruited a number of Anglican devotees from the Banks and Torres on his plantation who were determined to keep the congregation together at all costs. While the church members were congregated at Mr. Henin's plantation, negotiations were underway with the Bishop of the Solomon Islands to rebuild the Tebakor church. The Bishop agreed in principal for the church to be rebuilt and designated Tasiu Mathias Tabe of Pentecost to clear the site adjacent to the old church site. Another Ifira man known as Kaltanak allocated the land on which the church was to be built. Harper Lini and a couple of men from Ambae and Pentecost were recruited to build the new church. This church now still stands after more than 50 years. When the church was completed Fr Ben Bani was appointed by the Bishop to man this church - the second Christ Church. During this time Tasiu Tabe was undergoing theological training. After successfully fulfilling the requirements, he was ordained priest to replace Fr Ben Bani at the Tebakor Church around early 50s. Members of the Church from Pentecost, Ambae, Maewo, Banks and Torres, and Paama were encouraged to move in and live around the church compound to take a more active part in church spiritual activities. During this time, the members of the church decided to appoint a Chief among them to act on their behalf. August Kasten from the Banks islands was elected chief who then ruled on until the late 60s. The Tebakor church lived on but experienced a rather unfortunate history towards the end of the 50s when the Landowner became increasingly concerned over the many settlers in the church area. It was decided then that another plot of land must be found to relocate the church. August Kasten, as Chief of the people then organized his people to seek new land on which to relocate the Church. A French planter by the name of Henri Ohlen was approached who then agreed to sell to the church a block of his land known as Tarua at Tagabe. The Bishop from the Solomon Islands then authorized Dr William Henry Rees on the 28th August 1961 to finalize negotiation with Mr. Ohlen to purchase the Tarua at Tagabe. Dr Rees then was an Officer to the British administration of the New Hebrides. On the 3rd of January 1962, a deed was signed on behalf of the Bishop to allow the Anglican Church to move to this new site. Chief Kasten and Keith Woodward, the latter being a devoted Anglican member from the British colonial administration, organized with all Anglican devotees to contribute 50 cents each month towards the purchase of the land. This fund was collected and with the help of the [3/4] New Zealand Board of Mission, who contributed £600, purchased the land from Mr Ohlen. The devotees contributed a total of £400. Having secured the land, the services of Harper Lini was called upon again to build the new church at its current location at Tagabe. 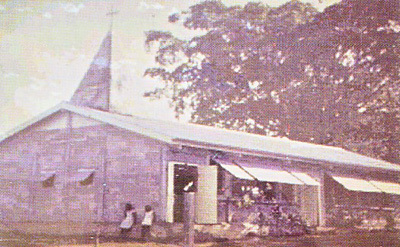 Work was completed on the new church in time for its opening on Easter day of 1964. The high level of enthusiasm then led to the establishment of a primary school next to the church. The school was very successful during its time and produced some of top students who went on to Universities. Another project of that era was the erection the Mother's Union Hall, which was a perfect example of co-operation and development of the church. Later on several Priests houses were built along with the Woodward youth hostel, named after Keith Woodward. The church now has a confirmed membership of 4,000 and is growing at the rate of about 2% annually. Anis Mathias, Joseph Kasten, Veve Leinas Willy, Godwin Ligo and Fr George Vari. Story was researched and compiled by Ephraim Mathias.